In our fast paced society, many of us have lost the ability to simply be present in our bodies. We go through our days following our schedules, and to-do-lists, never really noticing what is going on inside. From an early age we are taught to ignore our body’s sensations. While these sensations can be convenient to disregard at times, if we consistently disregard what our body is telling us, there may be a price to pay! We’ve been taught, in subtle ways, to ignore our body since we were very young. Most of these messages were given by well intentioned adults in our lives. Having to wait until mealtimes to eat. Being required to clean your plate. Waiting to go to the bathroom until between classes. Being taught to hold back when you have to pass gas. Having our feelings minimized, dismissed, or punished. Being pushed to keep going when we were tired and needed to rest. What About Learning Self Control? Many of you may be thinking that these are necessary lessons that we needed to learn to function properly in the world. While there is some truth to that, there is a way to honor both the body and social norms. Ideally, we would recognize the messages that our body sends and then choose how to act on them. We don’t need to follow these sensations impulsively, but it is important to recognize them and consciously choose our response. You are exhausted when you wake up in the morning, but have to get to work. Take a moment to recognize how your body feels: do you have itchy eyes, a heavy head, aching body, etc. Assess the situation - Can you do anything to get more rest now? If not, that’s okay. Just recognize both what your body is telling you and reality of the situation. Make a plan - You may decide that you can still make it to work on time if you sleep a bit longer. You may have to push through and get out of bed. If you can’t respond to it’s message now, you may decide to honor your body by going to bed early that evening. It is mealtime, but you are not hungry. Take a moment to recognize how your body feels: Many people eat according to the clock without listening to their hunger cues. Assess the situation - Is this your only opportunity to eat or can you push lunch back awhile? Make a plan - If your lunch consistently comes earlier than you are ready for it, can you arrange your day differently? If not, perhaps you can eat a lighter lunch and plan to have a snack in the afternoon. You have a strong emotion to a situation with another person (sadness, anger, fear, etc.). Take a moment to recognize how your body feels: Is your stomach in knots? Is your face flushed? Do your eyes sting with tears? Are your fists tight? Is your breathing restricted? Assess the situation - Is there a way for you to appropriately express your emotion? Consider the relationship you have with this person, the strength of your emotions, and possible outcomes before taking action. Make a plan - Maybe you are in a position to talk things through in the moment. Perhaps you are not able to address it in the moment, but could come back to the issue at a later time. You may decide that some situations are best not addressed at all. In these situations you can still honor the emotion by naming it and taking time for self care (talking with a trusted friend, journaling, or doing something special for yourself). You have been feeling constipated recently. Take a moment to recognize how your body feels: are you having to strain? Have you been feeling bloated or gassy? Assess the situation - Have you been drinking enough water? Have you been eating enough fruits and vegetables? Are you giving yourself enough time for regular bathroom trips after a meal? Do you need to focus on breathing and relaxing your sphincter rather than pushing? *Listening to hunger cues and recognizing emotions are big topics! People with certain medical conditions or mental health concerns will have to take special precautions (those with diabetes or anorexia, those with a history of trauma, etc). If you are dealing with any of these issues, please feel free talk with me. I will try to connect you to some helpful resources. I want to give you a couple of exercises that you can easily do on your own to reconnect with your body. 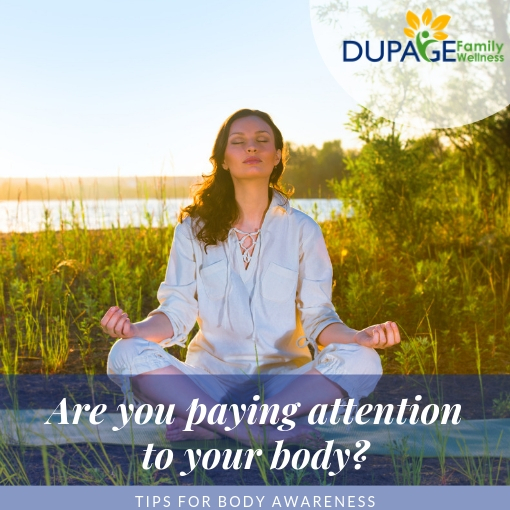 Keep in mind that there are entire practices devoted to helping you get in touch with your body (yoga, meditation, somatic experiencing, etc.). Don’t be discouraged if you are not able to stay focused when you first try these exercises. Simply notice if you get distracted and redirect your thought back to the exercise. It takes practice to be really present in the moment! A Simple Grounding Exercise - Settle in a chair and take a few relaxed breaths. Then draw your awareness to 5 things you can see, 4 things you can feel, 3 things you can hear, 2 things you can smell, and 1 thing you can taste. A Simple Body Awareness Exercise - Start by sitting comfortably in a chair. Take a minute to notice the chair supporting you, as well as the ground supporting your feet. Now, take some time to notice your breath. Don’t try to change it, simply notice the quality of it. Next, open your eyes and take a few minutes to very slowly look around. Were you able to stay present with your body and breathing while you looked around? Simply notice these things without judgement. If you are interested in exploring this more, check out the following articles (and guided meditations). What is one thing you can do this week to listen to your body? I do not expect you to do everything on this list, but there may be one thing that stood out to you as you read this article. Making even small changes, consistently, can make a big difference. As you start paying attention, you may be surprised by what your body is telling you! If there is an area in which you’d like to make a change, start a journal to really pay attention to your thoughts and actions around this area on a daily basis.